DICE the zucchini, 300 grams of pumpkin and 3 green bell peppers. Pro tip: Cut the pumpkin with a bread knife. If you still are having trouble cutting the pumpkin in half, put it in the oven for 10 minutes on 150 degrees celsius or 300 degrees fahrenheit. The pumpkin skin will be softer, and easier to cut. Big thanks to our very good friend Marielle for this tip! RINSE and peel the skin off the Dutch carrots using a potato peeler. Cut the carrots into slices. Also rinse the green beans and slice them into small pieces. FINELY dice the 2 shallots, click here to learn how you can dice onions like a pro! LAYER each prepared vegetable and add LOADS of salt in between each layer in a very large bowl. COVER the very large bowl with cling film and refrigerate for 24 hours. 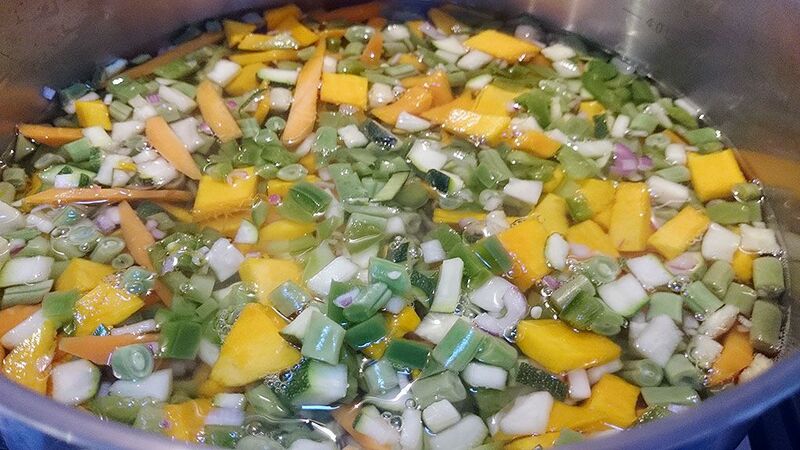 This will initiate a process that separates a lot of the moisture from the vegetables into the bowl. This prevents a soggy piccalilli in the end. If everything went well, you should now be one day further, grab the large bowl containing the vegetables from the refrigerator. There should be a lot of water on the bottom of the bowl. THOROUGHLY rinse the vegetables with cold, running water. DRAIN the vegetables using a large strainer and place it back into the large bowl. BRING 600 ml of water and 1 liter (1000 ml) of plain vinegar to a boil in a large pan. 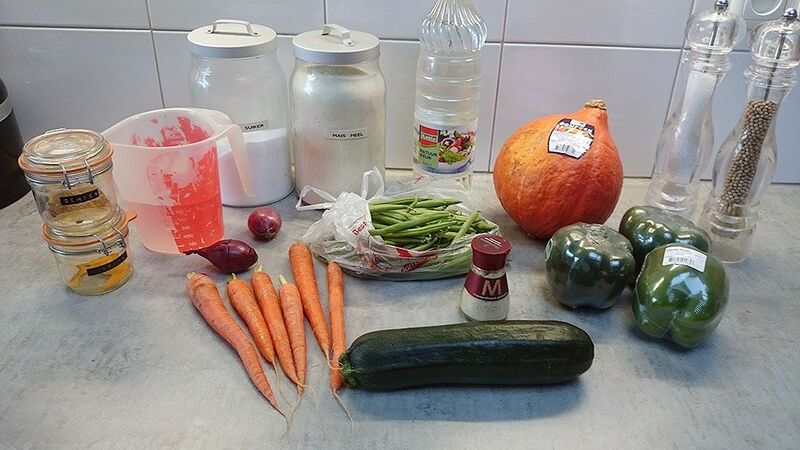 DISSOLVE 200 grams of sugar, then add in all of the vegetables. COOK vegetables for 20 minutes, or until tender. STIR in 2 tablespoons of mustard powder, 1 tablespoon turmeric and 1 teaspoon ginger powder. 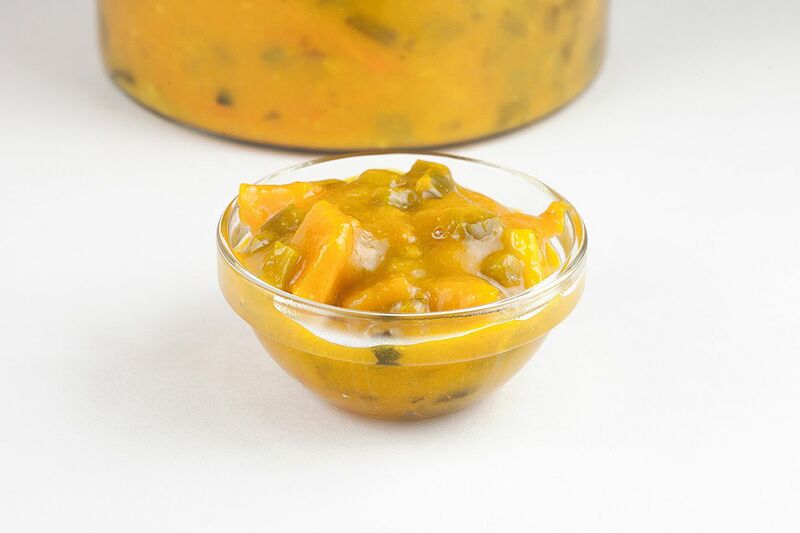 The turmeric will give the piccalilli its typical yellow color. 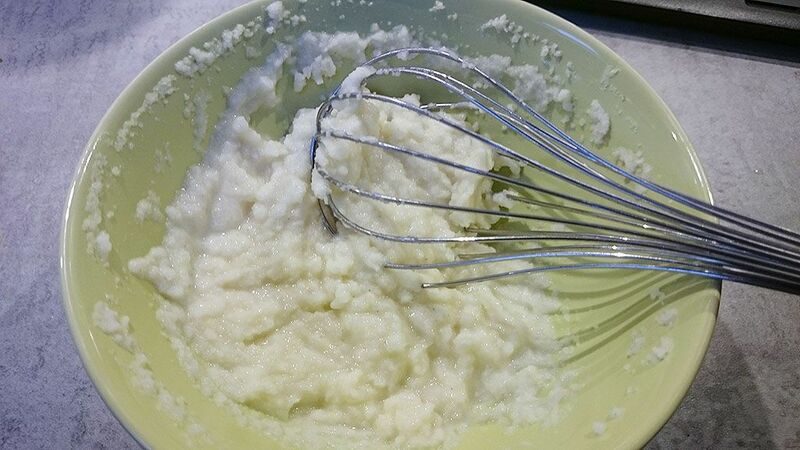 MIX 4 tablespoons of corn flour together with a few big squeezes of vinegar in a small bowl, until it looks like the example above. 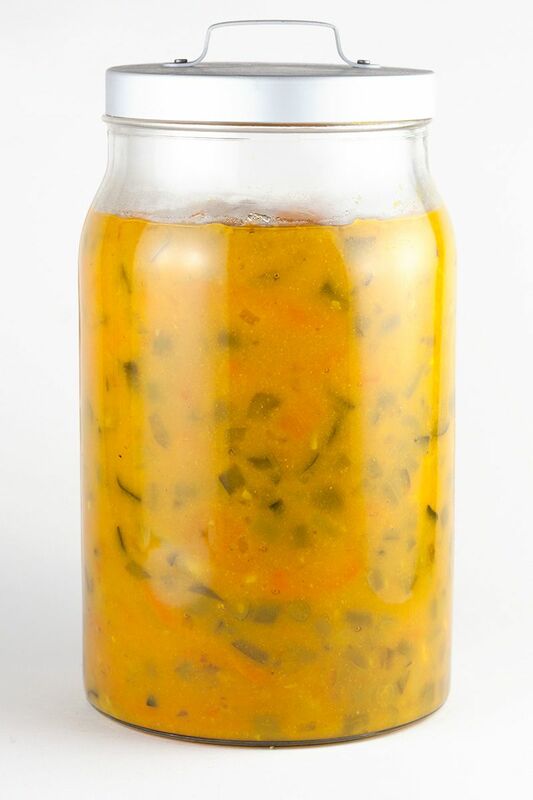 This easy mixture will bind the home-made piccalilli together, otherwise we’ll end up with a very sour soup! STIR the mixture into the large pan and season with freshly ground salt and pepper. When done, let cool off completely and pour it into sterilized jars. 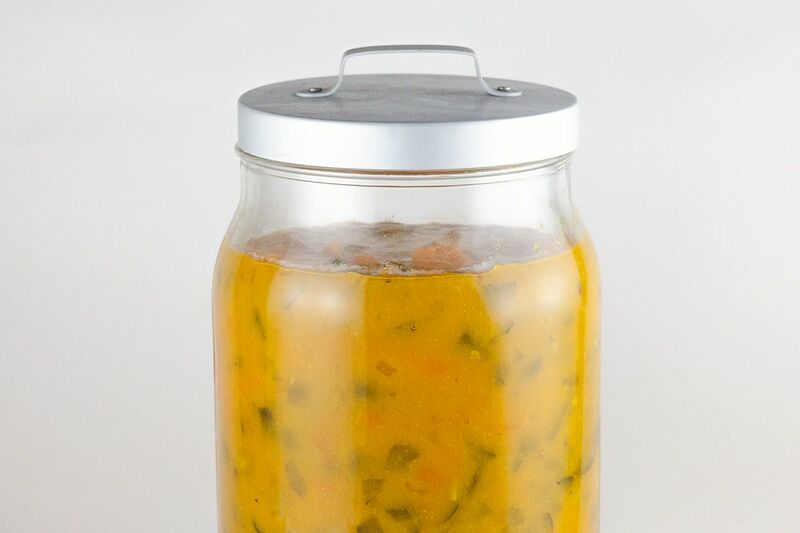 When properly sealed, these jars of home-made piccalilli will preserve their contents for up to a year. Refrigerate for up to 1.5 weeks after opening. 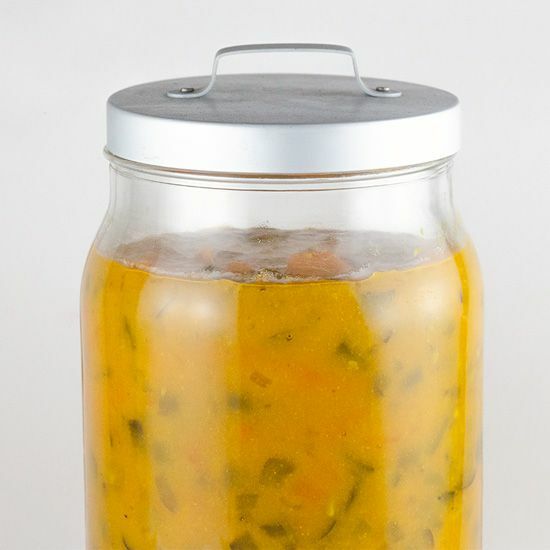 Piccalilli goes well with most types of white fish and smelly cheeses. Enjoy!